Hello and welcome to another Digital Tuesday Challenge. This week's challenge is a color challenge! The colors we want to see on your card or project are red, white, and black! Just be sure to include at least one digital element too! Our sponsor this week is 'Digital Delights by Louby Lou' and they are giving away one $5.00 gift voucher to one lucky randomly chosen winner. To make my card, I used a Digital Delight image called 'Shelby the Seal'. My sketch is by I Love Sketches and the paper is by Bo Bunny. I mounted the main image panel up on dimensionals. The heart is a button. If you'd like to play along with us this week, simply click on the Digital Tuesday Challenge Blinkie in my sidebar and it will take you directly to the Challenge Site with further instructions. Hello! Today I have a Doodle Pantry card to show you that uses a new image called "Quirky Mouse". This image is available in both outline and pre-colored and comes with digi papers and several different sentiments. To make my card, I used the out-line image and colored it myself with Copic Markers. I then cut it out and pasted it to the sentiment panel. My sketch is by MFT (MFTWSC53). I used the cheese digi paper available in the package, but the rest of the papers are just card stock solids. I embossed the grey papers with my Cuttlebug. Sorry if I haven't been around much in Blog Land. I've been working constantly getting our store ready for inventory. I have to work 9 days straight, I'm on day 4 now, only 5 more days of work before I have a day off! It seems all my life is right now is work, come home, eat, sleep, and back to work again! Oh well, it will soon be over. Digital Tuesday Challenge 'New Beginnings"
Hello and welcome to another Digital Tuesday Challenge. Our challenge this week is 'New Beginnings': simply make a card or project that has something to do with a new beginning and be sure to include at least one digital element. Our sponsor this week is Bugaboo. I chose to make a Wedding Card for my New Beginning theme. The image is from Bugaboo and is called "Just Married". My sketch is from I Love Sketches and the paper is Bo Bunny 'Crush Collection'. I printed the image twice and popped just the car up on dimensionals. I added Stickles to the bride's veil, hearts, and flowers. If you'd like to play along with us this week, simply click on the Digital Tuesday Challenge Blinkie in my sidebar and it will take you directly to the Challenge Site with further instructions. Hello! Is it cold enough for all of you that live in cold weather states? It certainly is for me! I've been wearing long winter underwear to work the past couple of days! Today I have a card to show you that uses an image from The Paper Shelter. What sweet images this company has; all so beautifully drawn! This image is called 'Kisses'. It is available in outline and pre-colored. I used the outline image and colored it myself. My sketch is by I Love Sketches. The Paper Shelter is having a Design Team Call until the 24th, so if your interested, check it out! First of all I'd like to apologize if I haven't been leaving comments on your blogs lately. It seems the past couple of weeks, blogger has been giving everyone troubles. Some blogs I can see, but I can't leave a comment, and other blogs I can't even see at all. Hopefully it'll all work itself out eventually. Now onto today's card! Today's post uses an image and sentiment from Doodle Pantry called 'Lil Hummer'. I'm in love with birds, and hummingbirds, although they can often scare me half to death when I'm working in my garden, are one of my favorite birds. I love their natural curiosity and how they are so tiny, yet so fearless. This set comes with several different sentiments, digi papers, and is available in both outline and pre-colored images. To make my card, I used the outline image and colored it myself. The sentiment panel and image are both popped up on dimensionals. The sketch is by Verve, and the paper is My Mind's Eye Stella Rose "Mabel". Hello and welcome to another Digital Tuesday Challenge! For this week's challenge I am the hostess and I chose the theme 'Make a Romantic Card'. It could be for Valentine's Day, a Wedding, and Anniversary....anything to do with LOVE. Just be sure to use at least one digital element on your project! Our sponsor this week is MyGrafico and they are giving away 1 digi set and a 20% off discount to their store to one lucky randomly chosen winner. To make my card, I actually used a 'freebie' on their site called "Love is the Air", designed by Mujka Chic. I printed the image twice and popped both the umbrella and the heart up on dimensionals. The paper is Bo Bunny 'Crazy Love'. Hello! Today I have the cutest new Doodle Pantry image to show you called 'Love Birdies'. It is available in outline, pre-colored, and with several sentiments and digi papers. Hello! Digital Tuesday Challenge Blog Holiday Break is finally over! Yeah, it was nice to have a break over the busy holiday season, but I'm happy to back to work too! Here is my first DTC Post for the New Year! Our challenge this week is "Punch it Out!" Simply make a card or project that uses punched shapes on it and be sure to include at least one digital element. Our sponsor this week is 'Spech Designer Stamps' and they are giving away three digis to one lucky randomly chosen winner. To make my card, I used the Spech Designer Stamp 'Kei with Cocoa', designed by Widya. My layout is from MFT (MFTWSC52), and the paper is by Cosmo Cricket. The punches I used were the border punch beneath the image and the snowflake punch. The main image is up on dimensionals, and I also cut the mug out and popped that up on dimensionals as well. I put Liquid Applique on the ear muffs. If you'd like to play along with us this week, simply click on the Digital Tuesday Challenge Blinkie in my sidebar and it will take you directly to the Challenge Site with further instructions. I needed a quick and easy Anniversary Card for some friends at church so I made this one in about 10 minutes using a pre-made tag and sentiment from 'Me and My Big Ideas' and paper from DCWV 'All Dressed Up'. I personalized the card by hand writing the couple's names on the tag. 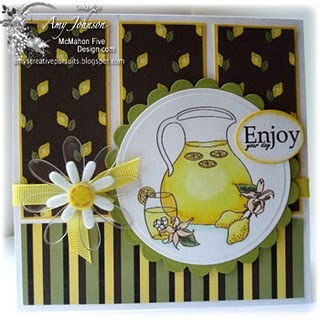 I love this card because of the sketch and the lemon designer paper. The colors are so pretty together and I like the acrylic flower with the felt flower. I really love this card because of the colors/designer paper and the Christmas Message. It's so hard for me to make religious Christmas Cards. I don't know why. But I felt this card really worked. I love the clean simplicity of this card, the doodled frame, and the colors. The colors and the coloring of this card is really pretty. I love the snow accents too. It's so hard to make 'cool cards' for teens, especially teen boys. I think this one would be a hit with just about any teen. I just love how this one is so clean and simple, yet has so much interesting details at the same time. Great colors too! And I really love the dimension with this image. I love all things Pure Innocence! It's impossible to make a bad card with one of these images. I love the unique color combination of this one, and the fluff on the hat. I just like this one cause it's so different. And I actually used my Cricut Expression to make it. Most of the time that $200 + dollar machine just sits and gathers dust. I'm just not a die cut girl! 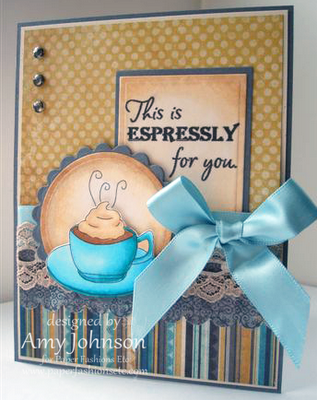 I love coffee images, and this color combination the sentiment is great too! This is a project my daughter and I did together as a Christmas Gift for the man in the photograph. I love the frame in the picture, but most of all, I just love the photograph. It's so hard to capture that perfect picture of someone: to grasp their personality in a single shot. Most pictures, especially professional ones, just aren't realistic. They are usually pictures of what people wished they really looked like or who they really wished they were, and not who they really are. I love the colors in this card, the image, and how I popped the image up against the designer paper. My last card I just really like the sketch, the colors, the hemp trim, the glazed apples. 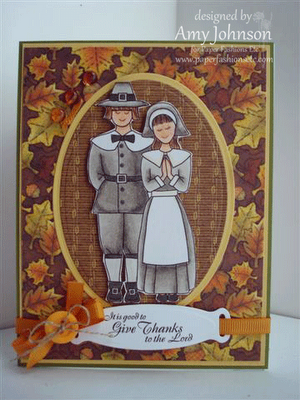 There's so many pretty little details in this card, yet, it is so simple. I hope you enjoyed my year in review. I look forward to another great year of blogging with you!